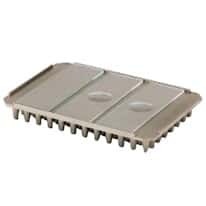 dock and squeegee, EcoControl and EcoStudy software USB stick, 50 PCR plates, 50 plate seals, Ethernet cable, and power cord. 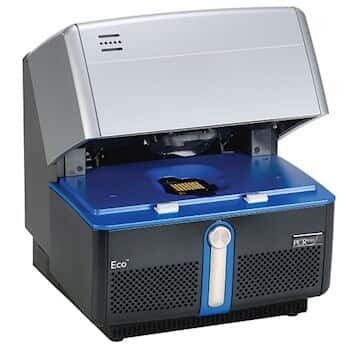 Compact real-time thermal cycler accommodates a 48-well polypropylene PCR plate utilizing the same geometry as standard 384 well plates, but only 1/8 of the size. Because of this, you can dramatically reduce the qPCR reagent volumes compared to traditional 96-well instruments, saving precious samples, while still producing a strong fluorescence signal. Suitable for both single labs and core facilities, the thermal cycler’s fast cycling enables several experiments per day. A specially designed thermal block delivers a unique heating and cooling system that provides accurate ±0.1°C temperature control and quickly cycles from one temperature to the next. Also featured is an advanced high-performance optical system that delivers precise and sensitive fluorescence detection, facilitating all four color multiplex applications with only a six second read time for all four colors across the entire plate. The unit is MIQE compliant and the high resolution melt (HRM) functionality is standard. Easy-to-use software provides instrument control, data collection, and data analysis. An ergonomic plate loading dock allows for quick loading of the plate and is backlit for clear visibility.